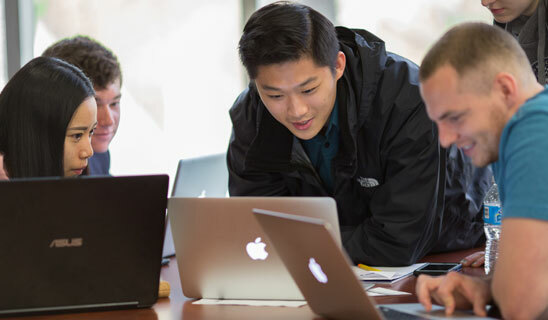 Students may enhance their Bachelor of Science in Business Administration degree by simultaneously completing a second degree from the Dietrich School of Arts and Sciences. The Double Degree Program provides an excellent opportunity to pair business with other academic disciplines. To earn a Bachelor of Science in Business Administration (BSBA) degree and either a Bachelor of Arts (BA) or Bachelor of Sciences (BS) degree, a student must meet the admission requirements of both schools and earn a minimum of 150 credits (minimum of 60 credits for the BSBA, and 90 credits for the BS degree). Students must complete all Dietrich School and general education requirements and an Dietrich School major (but not a related area), as well as complete all of the Pitt Business core requirements and a major in Pitt Business. Dietrich School students earn a BA, BS, or BPhil degree, depending on the program of study. Pitt Business students may complement their Bachelor of Science in Business Administration (BSBA) degree by also earning a Bachelor of Arts (BA) in Health Services degree. The BA in Health Services allows students to specialize in business and learn about health care as an industry. The program is offered in partnership with the University of Pittsburgh’s College of General Studies. Students earn two degrees: a BS degree in their business major(s) and a BA degree in the health services domain. If you are considering the double-degree option, contact Pitt Business Admissions.